Benjamin Franklin is one of the most prominent characters in our nation's history. Not only did he invent the lightening rod and bifocals, but he also facilitated fire departments and universities! Now you can become his doppelganger with this Adult Benjamin Franklin Costume. This costume is great for historical plays! 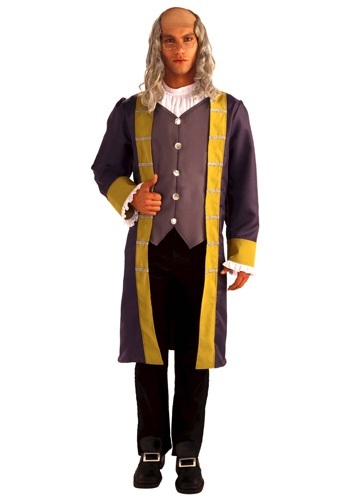 Wear this Adult Founding Father Costume and sign your John Hancock on the Declaration of Independence (but don't do it really, or you'd get in some serious trouble)! 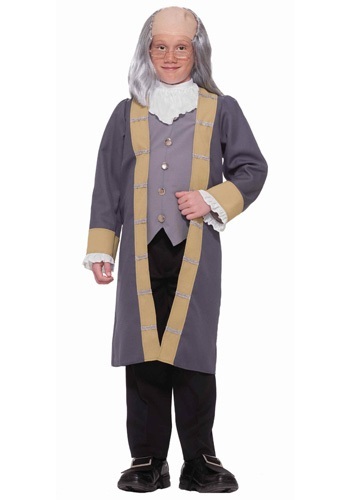 Add white knee socks, buckled shoes, a pirate shirt and a tricorn hat to become a stylish Colonial gentleman. We're totally sure you could build an empire nation with that brilliant strategist brain inside your head, but you're just too busy to do it just now. We've got a little something that might motivate you. A Napoleon Bonaparte outfit might be just the kick you need to finally bring the entire world under your reigns as its new emperor! Enjoy a glorious feast with the Indians. 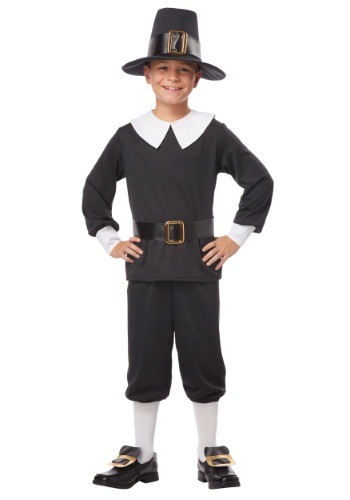 Wear this Adult Pilgrim Man Costume while you break bread with the Native Americans. This costume will put you in a peaceful state of mind...now pass the cornbread! Pair it with any Indian costume for a cute couples' idea. It's also ideal for plays, and both Thanksgiving and Halloween! Look who has just landed on Plymouth rock! 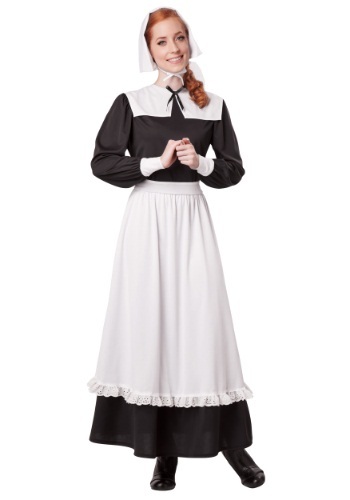 If you are looking to make an entrance comparable to the entrance made by the Pilgrims stepping off the Mayflower, you may want to pick up this Adult Pilgrim Woman Costume! This costume is great for celebrating a traditional Thanksgiving feast. This costume is also great for parades, plays, and festive holiday activities. 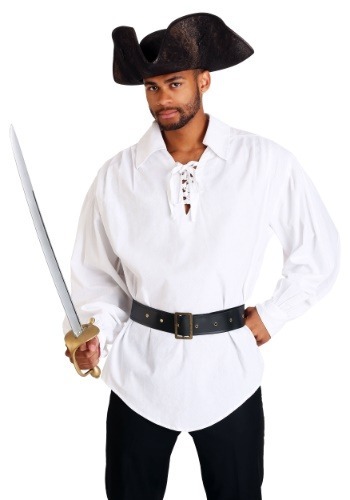 This Adult Pirate Commander Costume is perfect for plundering the Spanish Main, but would also work very well as a colonial or Revolutionary War-era costume. Wear it with your own dark pants, or buy our men's classic navy pants. Add boots and pirate weapons to complete your look. 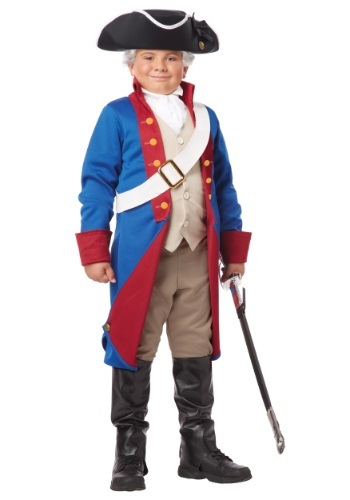 General Washington might have worn a uniform similar to this Boys American Patriot Costume! Your child can fire the shot heard 'round the world when he wears it, or cross the Delaware, or hold off shooting the Redcoats until he can see the whites of their eyes. This is great for re-enacting historical events! "The Redcoats are coming! The Redcoats are coming!" That was Paul Revere's warning to the farmers and villagers of Middlesex, Massachusetts on the night of April 18th, 1775 after he saw the two lanterns in the tower of the Old North Church. "One if by land, two if by sea," had been the agreed code. 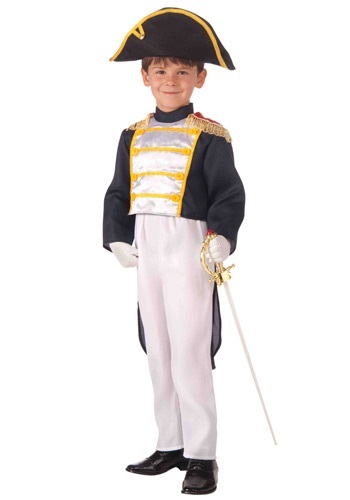 Your child can be one of the British soldiers Revere warned of in this Boys British Redcoat Costume. Great for a school play! Over two hundred years ago, America's first president helped lead the way toward freedom. 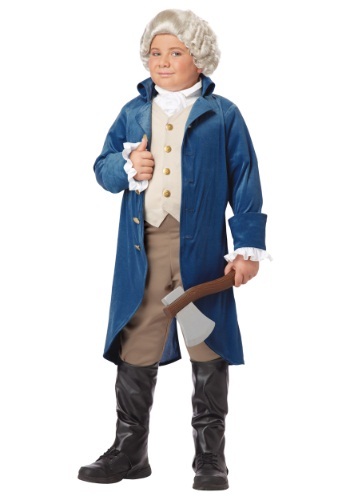 For this we should honor him by dressing our children in a boys' George Washington costume. 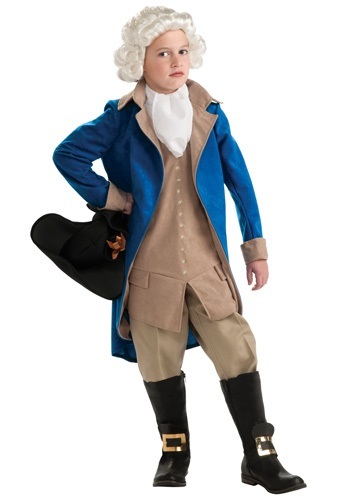 It is our patriotic duty to make sure each new generation remembers how George Washington dressed, especially if we are portraying him in a play or skit. Don't waste time trying to decide what to wear before meeting the Native American's. Slip into a pre-styled Brown Colonial Wig and avoid awkward social hair mishaps. Yes, a ship full of white men will look strange to the natives but at least your hair will be great! Let there be light! Benjamin Franklin is most famous for demonstrating that lightning is electrical and for inventing the lightning rod; his discoveries are taught in elementary schools across the nation. 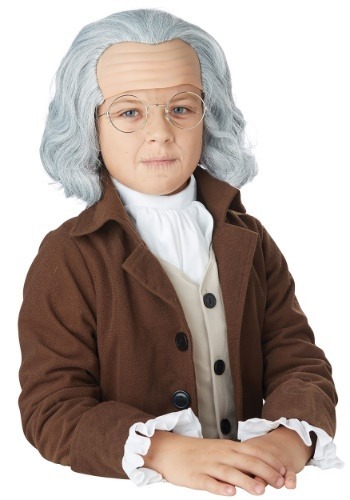 I bet your child would love to wear this Child Benjamin Franklin Costume while learning about the prominent American figure. This costume is also ideal for school plays! Become the wise statesman who wrote "Poor Richard's Almanack" and signed the Declaration of Independence. This writer, scientist & statesman of the Revolutionary War era helped to shape our nation into what it is today. 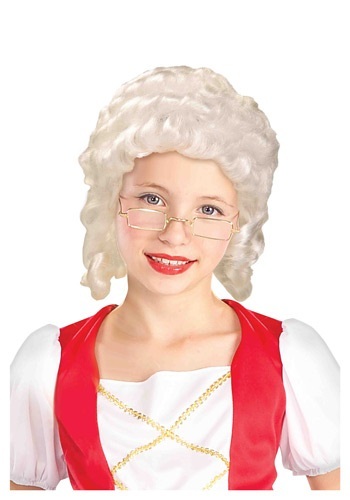 This Child Benjamin Franklin Wig is perfect for plays, historical re-enactments or just for fun. 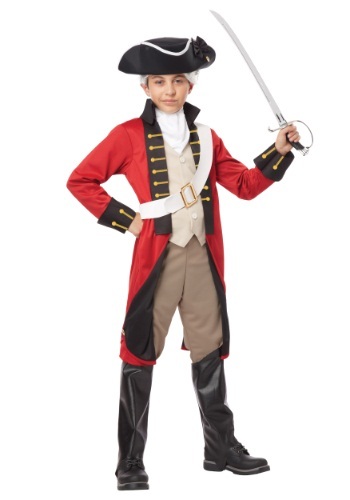 If your son wants to re-enact George Washington crossing the Delaware River, this Child Colonial General Costume is ideal! Add shoe buckles and a toy sword to complete the look. 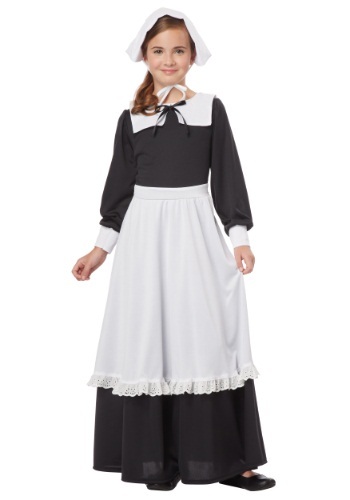 Your daughter can step out of Colonial Williamsburg into the 21st century in this Child Colonial Girl Costume! Add a pair of shoe buckles and a market basket for collecting Halloween goodies. Any fashionable gentleman of the 1700s might have worn a wig like this one. The first five Presidents of the United States wore similar wigs, too. 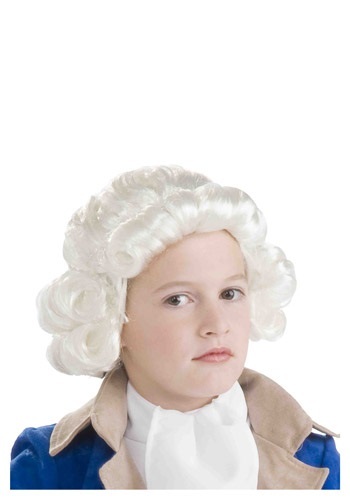 Now your child can travel back in time to those days of yore with this Child Colonial Man Wig. 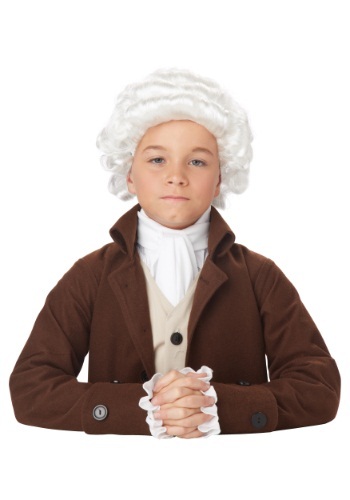 Your child can't play George Washington or Thomas Jefferson without it! Davey Crockett was an amazing historical figure. He's perhaps known best for his appearance on the television show in the 1950s, portrayed by the legendary Fess Parker, but the real person was super interesting, even without all the embellishments. For instance, did you know that he killed himself a bear when he was only three? Oh, and did you know that he fixed up the crack in the liberty bell before serving in congress for a spell? Yep, fixed up the government and laws and stuff. Wait a minute... that's the song! Oh no, now it's in my head! 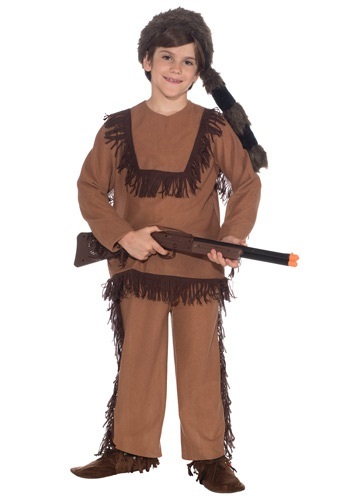 *insert humming here* If your child wants to get out there and fight river pirates and defend the Alamo, then you just gotta get him this Davey Crockett costume. With its realistic fringe and coonskin cap, don't be surprised if he brings home some varmint for dinner! Smart men always have crazy hair! It's a fact. Look at Frederick Douglass. The guy fought for freedom in the U.S., wrote compelling essays, had a bridge named after him and kept a pretty wild hair-do. 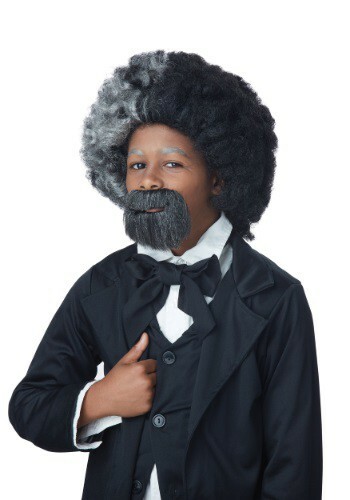 Not everyone can grow a cool 'fro like that, but that's why we have this Child Frederick Douglass Wig and Goatee! It helps any kid get the look of the historical figure, whether it's for school plays or just for fun around the house. Sometimes kids have no idea what they want to be when they grow up. Some kids say they want to be a doctor, and some say they want to be a lawyer, and some of the smart kids even say they want to be an ice cream tester. But you know you have a unique kid on your hands when they say they want to be president someday. While eating ice cream sounds pretty good to us, there's no better goal for our youth than to follow in the footsteps of our forefathers and one day become president! 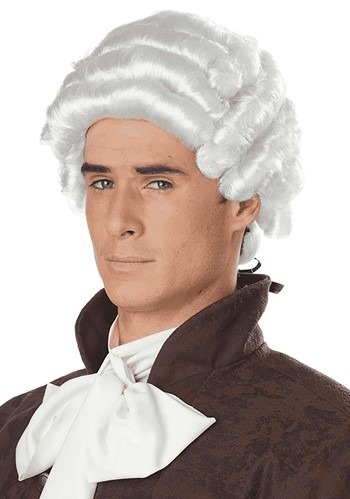 With a Colonial Boy Wig like this one, who knows what could happen? He just might be president someday because he looks so convincing... or he might just chop down your cherry tree, but don't worry, he'll be honest with you about it if he does! Way back in 1621 an event happened that would eventually become a beloved holiday. At Plymouth Colony, in what is now Massachusetts, a group of settlers got together to give thanks for being with one another and being in a new land. 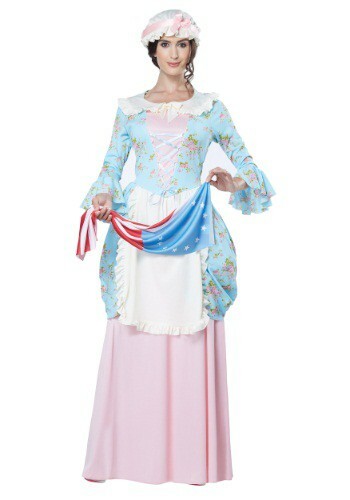 Now your little girl can recreate the look of these early Americans with this great Colonial Girl Costume. Be sure to check out our other great Thanksgiving-themed costumes to help you recreate the very first celebrations of that holiday! If you were cooped up in the Mayflower for months on end, your hair might turn white too. This wig recreates the look of a colonial pilgrim, freshly landed on the soils of America, so you don't have spend tons of time styling and dying hair to match the history books. Complete your historical look with this Mob Hat. You'll look right at home on the streets of New York circa 1760. 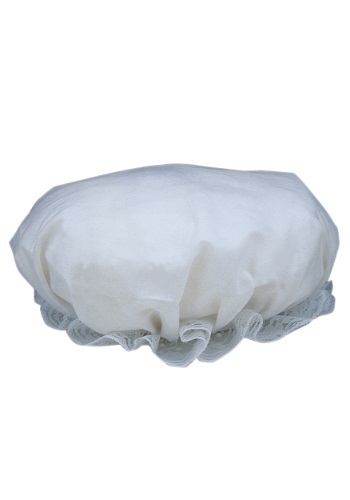 With this bonnet style hat and the right Colonial dress, you'll have no qualms about joining a revolution! 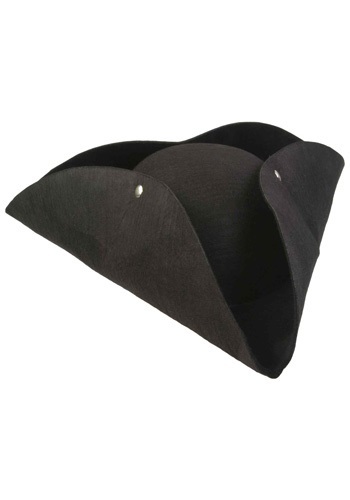 Before you set sail for adventure, a Deluxe Tricorn Pirate Hat is in order. Yes you're a bloody thirsty pirate who will probably rob and murder for months at a time but that doesn't mean you can't look put together while you're doing it. You owe it to yourself and your crew to look sharp. Start with the hat, it's a must! Here is your daughter's chance to be a part of history! 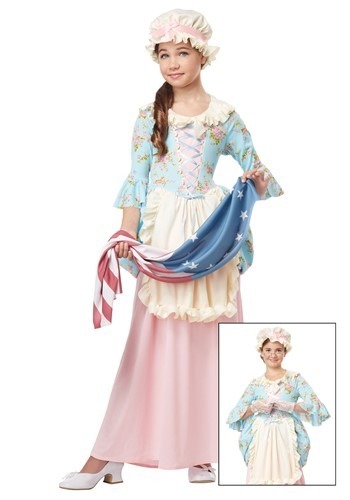 This colonial lady costume for girls will give her a look from the days of the Revolutionary War and with the included flag she can play the role of Martha Washington or Betsy Ross. When the story of America's beginning is told, make sure the tales of these ambitious women don't take a backseat to those of our founding fathers! Wear these Men's Breeches as part of your authentic Renaissance costume, paired with a Renaissance shirt and vest. Then add boots and a hat to become a prosperous 16th century merchant! Is anyone else surprised by the way pilgrims dressed? I mean, where was there sense of fashion? Stuck in the dark ages is my guess. Luckily we can celebrate their great journey while overlooking their hatred of interesting clothing. 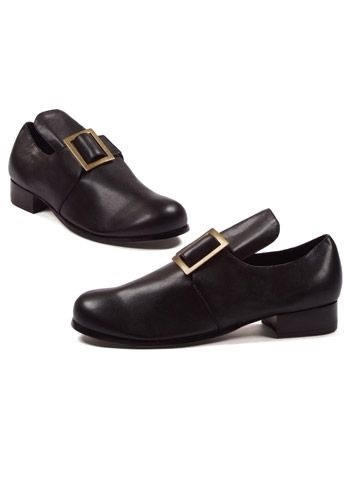 I may have to eat my words when these Mens Colonial Pilgrim Shoes are back in style. Did you know that wearing a powdered wig was a symbol of social status? 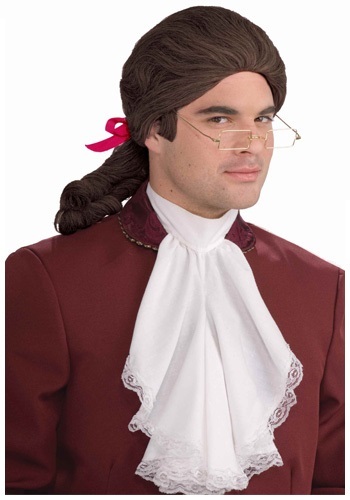 Show off your high status with this Mens Colonial Wig. It's sure to get you invited to all the best (and most sociable) parties! Good day, sir! 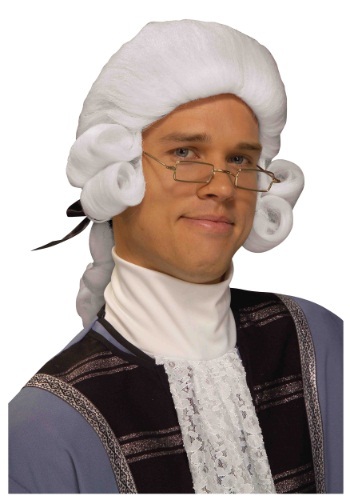 You'll notice a certain sense of dignity come over you once you don this Mens Colonial Wig. 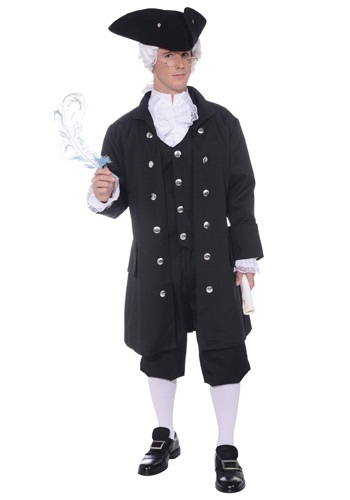 You'll have the refined look of a gentleman from colonial times. Pair it with a colonial costume and a pair of glasses and you'll feel simply splendid. How could you not? Those curls are absolutely dapper! The next time your child laments the fact that his iPad is not charged or that there are no new episodes of his favorite show to watch, we have a unique idea for helping him appreciate what he does have. 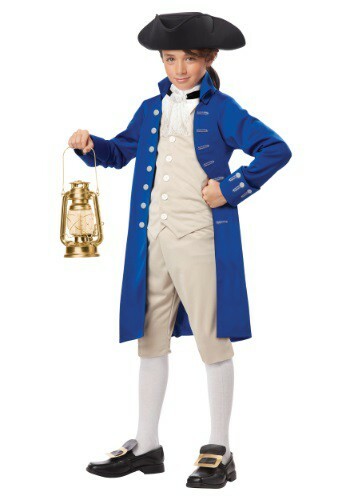 Simply have him change into this pilgrim boy costume, turn off all of the lights and challenge him to imagine what life would have been like over two hundred years ago for a young boy like himself. He likely would have been too busy helping around the house to worry about having free time for games and other entertainment. After having him sweep, wash your clothes by hand and haul some firewood for the cooking, we think he'll understand that there was no need for him to complain before and that he'll try harder to occupy himself without asking for you to intervene. Just an idea. This costume could also be worn for a Thanksgiving play or for trick or treating but that's up to you. 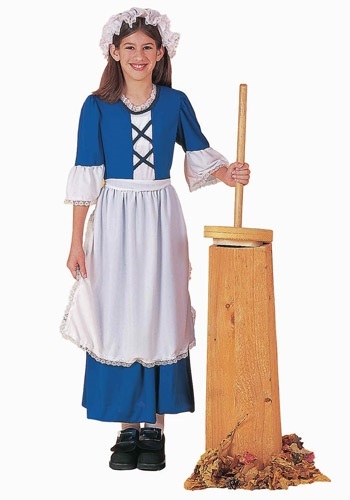 Churning your own butter and making your own candles are becoming a lost art, but thanks to this pilgrim girl costume, colonial fashion is about to make a come back. Sure, it may be a drastic change from today's skinny jeans and neon fabrics, but we think it has a simple elegance that will appeal to your daughter anyway. No? Then perhaps you could just pull this out at Thanksgiving for a festive reenactment instead. Churning butter before the meal is optional. 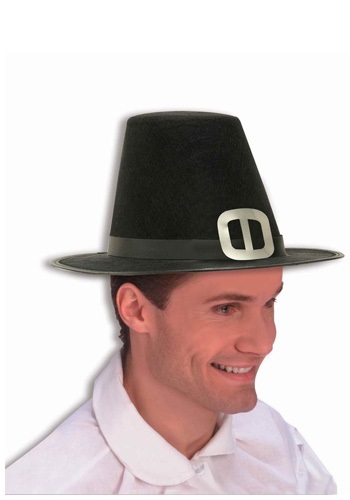 Get ready for your first Thanksgiving with this Pilgrim Hat. IWhile it's on your head, please try not to murder the friendly Native Americans. Seriously, they only want to help you. Did you know that the original settlers of Plymouth Colony weren't actually called "Pilgrims" until 175 years after they landed? William Bradford, the colony's first governor, did use the word--once--in his journal. But the group referred to themselves as "Separatists" or "Dissenters" because they disagreed with the Church of England. They didn't like many of the elaborate rituals used in worship, condemning them as "Papist." They emigrated to America to be able to worship the way they wanted to. In keeping with their disdain for elaborate ritual, they also wore very simple, plain clothing in muted colors, such as this Pilgrim Woman Costume. 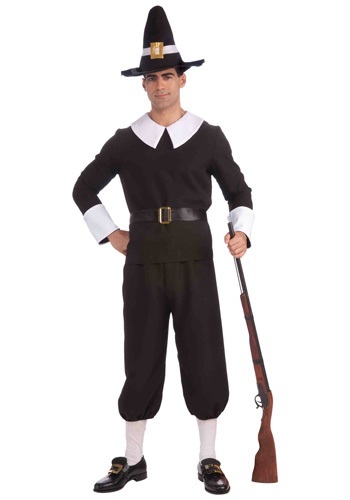 Wear it and become a respectable citizen of Plymouth Colony! Before you hit the Oregon trail be sure you're wearing this Pioneer Bonnet. You'll need it to protect yourself from the sweltering heat and possibly death. Hey don't blame us, it's a historical fact! 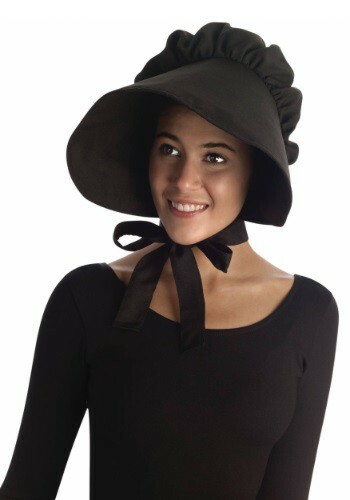 This Plus Size Pilgrim Woman Costume great for a historical or Thanksgiving program or for Halloween. Pair it with our Plus Size Pilgrim Man Costume for a couples theme. If you're keen on exploring a wild frontier, start your expedition right by looking fabulous! This raccoon tail hat is covered in faux fur and will add a classic look to your wilderness costume. A must have for Davy Crockett! The secret to commandeering a ship is a well dressed pirate. Dirty clothes, a ragged look and yellow teeth will get you nowhere. Any potential victims will spot you a mile away. Think about it. Who would you let get close to you a well dressed young man who happens to be on a boat. Or dirty unkempt man who happens to be on a boat. Think about that one. Don't even think about boarding that wagon without your bonnet. The Oregon trail is some tough sleddin' so not only are you going to want to look the part, you're going to want to have a practical headpiece to help you survive! 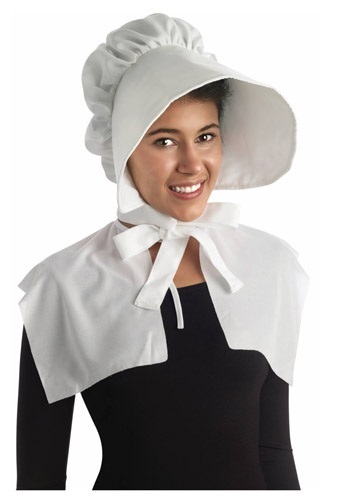 This women's Pioneer Bonnet brings the classic look from the history books to you! Forget about those Brits... This is America and we're going to start this thing out right. Now, everybody knows that strong, independent women are the backbone of any country, so you can join the revolution with this Colonial Lady Costume. You can be a seamstress and help out Betsy Ross with those flags, but we think you'd be better off planning things with John Adams and the boys. With this look, those redcoats will never know what hit em!